On the transfer to the Argentine side of Iguazu Falls, visitors will cross a bridge measuring 480 meters in length and built 1985, known popularly as the "International Fraternity Bridge" although its official name is International Tancredo Neves Bridge, connecting the two friend countries, Brazil (Foz do Iguaçu) and Argentina (Puerto Iguazu). 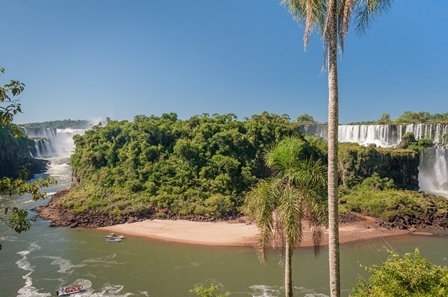 The Iguazu Falls on the Argentine side are located in the Iguazú National Park, province of Misiones, 28 kilometers from the center of Foz do Iguaçu and 45 kilometers from the Tropical Hotel das Cataratas of the Cataracts. The bridge lies approximately 20 kilometers, downstream from Iguassu Falls and just 2 kilometers, upstream from the confluence of the Iguaçu and Paraná Rivers, where visitors will be able to have a pretty panoramic sight of the Three-Frontier Landmark on each corner of the three borders: Brazil, Paraguay and Argentina. Upon arrival at the Iguazú National Park visitors will pass through a Visitors' Center equipped with an excellent infrastructure such as: toilets, medical emergency, and interpretation panels on the biodiversity of the Park, from where they will leave for the two stations of the ecological trains, idealized to transport people to the Park's attractions with a low environmental impact; with a duration of 20 minutes approximately as far as the several points of interest. The first stop will be at Cataratas Station from where the visit to the Upper and Lower part of Iguassu Falls begins. After the end of this tour passengers, will board the train again for the Devils' Throat Station, this is one of the most important observation points of the Falls. Superior Circuit: Tour on the Upper side of Falls approximately a 1.100-meter walk. Lower Circuit: Tour under the Falls approximately a 1.600-meter walk. 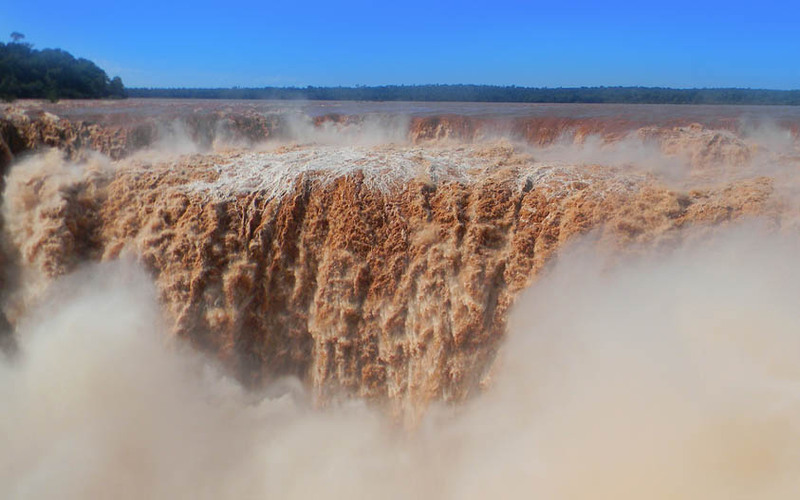 Devils' Throat : Tour of contemplation on the upper part of the Iguassu River over a catwalk built over the river spanning 1.100 meters which allows the chance to admire and appreciate the breathtaking spectacle offered by nature; the magnitude of the "Devils' Throat. Upper Circuit: Tour on the Falls approximately a 1.100-meter long walk. Devils' Throat : Tour of contemplation on the upper part of the Iguassu River over a flat 1.100-meter long catwalk built on the Iguaçu River that gives you the chance to to admire and appreciate the breathtaking spectacle offered by nature; the magnitude of the: "Devils' Throat". Recommendations: Light and comfortable clothes, sneakers, repellent. Opening hours: Everyday from 8 a.m. to 6 p.m.
Observations: Depending on country of origin of visitor an entry visa may be required. Location: Inside the Iguazú National Park, Argentine side.